Welcome to the last stop on the Teddy Bears in Oz Blog Hop. Along the way you have seen lions, witches, wizards, and now, munchkins – all created from the Cricut Lite Teddy Bear Parade. No matter how you arrived here in Munchkin Land, we’re happy to see you and share some insights into making teddy bear munchkins. 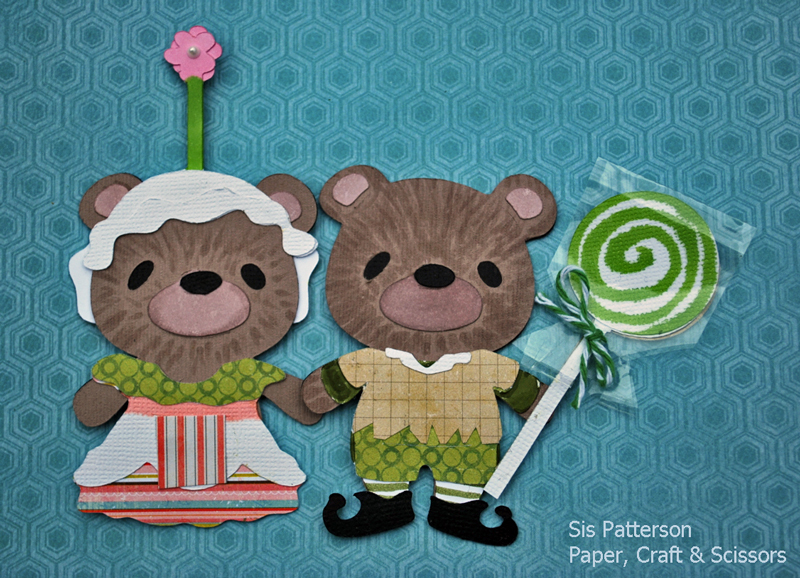 On the right, from the Lollipop Guild, is a bear cut at 3″ tall and using the elf ensemble from Teddy Bears on Parade. I cut the base in white cardstock and colored in the stripes and sleeve color. I hand trimmed the shirt to resemble the munchkin in the movie and added a collar from the tourist bear. I created the lollipop in the Cricut Craft Room using a capital “I” and a circle. Welding the two together and sizing them to the munchkin bear was super easy. I used a small acetate bag to wrap the lollipop. On the left is another munchkin with a mop cap from the “nightgown” on Teddy Bears on Parade. I used Cricut Craft Room to create a long stemmed flower (capital “I” and a flower on the cartridge) and welded that to the cap base layer. I cut it in white cardstock and added colors with Copics. I also cut a second flower on a stem and glued that directly over the welded layer for added dimension. There is also a dot of Liquid Pearls for the flower center. Her dress is from the “Belle” outfit and I added a hand-cut apron. For both bears, I added “furry” texture using Copic markers. Special thanks to Renee at I Came, I Saw, I Created for coming up with the terrific idea of a Teddy Bear in Oz Hop and the costume selections. There are some amazing techniques and ideas along this yellow brick road. If you arrived here on your own and wish to get on the path to see all of the fabulous creations, the full lineup follows. Before you run off though, leave a comment to be entered in a drawing for a $25 gift certificate to Simon Says Stamps. I will be drawing one winner on Sunday 13 January at 7:00 Eastern Time. And here is the whole line-up beginning with Renee. In addition to the Cricut Craft Room file for the Teddy Bears of Oz, she has a terrific prize available. and me (you are here) at Paper, Craft & Scissors. Thanks for stopping by and visiting and don’t forget to leave a comment. Adorable munchkins!! I can hear them singing now. So cute – love the idea of adding “texture effect” using markers – wonderful result. Thanks for sharing! Cute- love how you each have different characters. I think the markers added a nice touch of texture. lol….I knew they’d be cute, but you even surprised me….fur?! genius! and I love the flower detail you added to Ms. ‘Chkin’s mop cap. Just the right touch of munchkin whimsy….and your patterned papers make for fun and fabulous frocks. I am tickled pink after this visit and will be singing “we represent the lollipop gang” all day long now. Love them! You worked hard last night! I hadn’t even thought of adding accessories to the munchkins. They add a PERFECT touch! I also love the hand cut frock and apron elements and your sopics added fur. Thank you so much for joining the swap! Wonderful…as usual!! Such a cute lil’ Munchkin couple…OMG, can you imagine how CUTE their little babies would be???????!!! Your attention to detail is always amazing & inspiring!! Your Munchkins are adorable! I love the lollipop you made! These Munchkins are super cute! I can hear their little “voices”, oh now I will be humming all day! Such adorable munchkins! Love their outfits and the fur looks great! Yummy looking lollipop and just downright adorable munchkins!!! So very cute and creative!! soooo cute! love your munchkins! this whole blog hop is really fun, thanks to all of you for doing this! Hey, can I just send you my address right now and you can send me these adorable little munchkins and the gift card to Simon Says? LOL!! I just crack myself up sometimes!! These little bears are soooooooooo cute! You did an awesome job with the Copics! Soooo adorable!! Your munchkin bears are beyond adorable! I love all the details. Super adorable. I love how you went the extra step and added the lollipop. How stinkin’ cute. Nice job with the copic’s. I am just learning how to work with them. It would not let me post under my own, so am replying here. Both of these are so cute!! Love them!! Cute, cute cute!! Love the outfits! We represent the Lollipop kin… These are so darn cute. I love your little Munchkins and and little added accessories!! Super duper cute hop! Your munchkins are adorable. The “furry” feel and the lollipop really made them. The munchkins are very cute! This was a great idea. These are precious!! I have been out of the loop and will have to check out all of the blog hoppers!! What a fun hop– and your munchkins are tops! Love the furry details! Lol, wanna hear something funny? I thought they were singing the Lollipop Gang.